One of our most popular series of words has now been created in a classic infinity circle necklace. 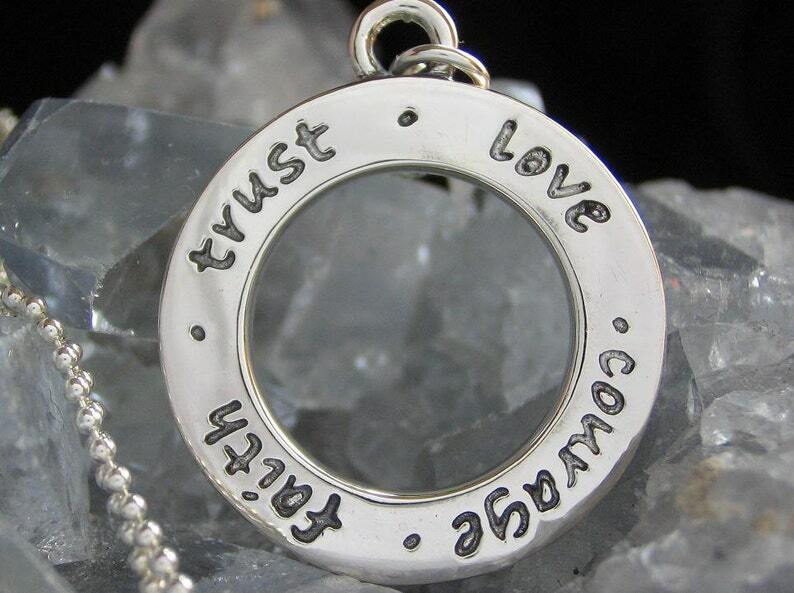 This necklace is designed as a wearable and palpable mantra, to aid you in repeating the phrase "Courage, Faith, Love, Trust" over and over in your mind. Let the power of these words seep deep into your heart. Know that the Universe is there to provide for you all you need is to have the courage to be who you are, the faith to believe in yourself, love for yourself and everyone around you, and the trust to know that you are where you are and everything is ok. The energy in this necklace is absolutely tangible. The phrase is laid out in a circle, creating an infinite repetition. The sterling silver pendant is approximate 27mm tall (1 inch) and 23mm wide (.9 inches). The chain is a 1.2mm Bead/Ball chain, which is available in a variety of lengths. Please make your chain length selection when adding to your cart. This necklace is also available in 14K gold. If you are interested in it in gold, please message us. This series of words is also available as a sterling silver or 14k gold ring.